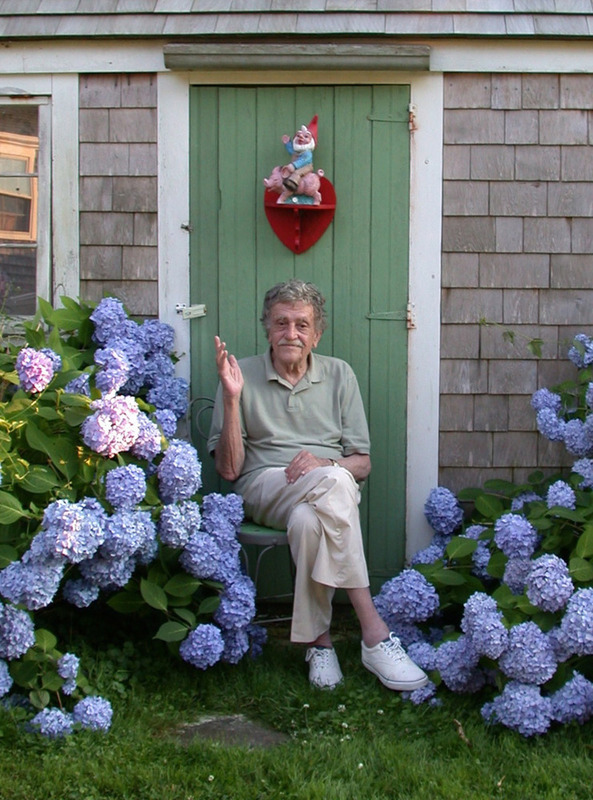 In 1989, eager to seek feedback from an established, highly influential author, and in an effort to simply reach out to a long-time inspiration, first-time novelist Mark Lindquist wrote to his idol, Kurt Vonnegut. 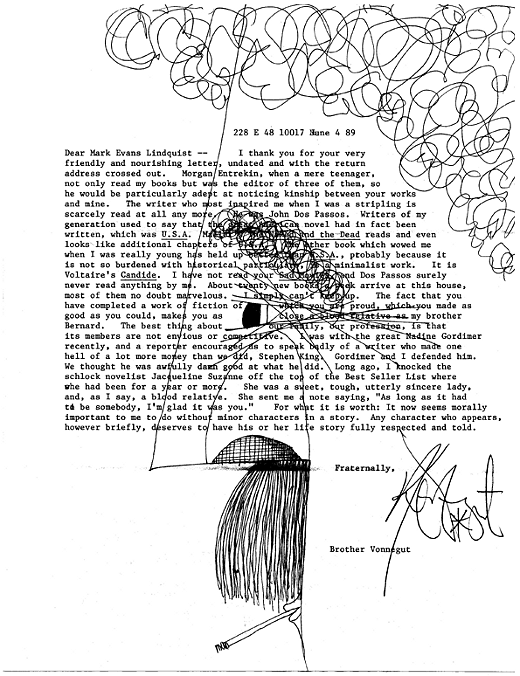 Some time later a reply materialised in the form of the admirably gracious typewritten letter seen below, in which Vonnegut spoke of his inspirations in the literary world and warmly welcomed Lindquist into the ‘family’; the missive illustrated by way of Vonnegut’s self-portrait, drawn in his trademark style. Dear Mark Evans Lindquist — I thank you for your very friendly and nourishing letter, undated and with the return address crossed out. Morgan Entrekin, when a mere teenager, not only read my books but was the editor of three of them, so he would be particularly adept at noticing kinship between your works and mine. The writer who most inspired me when I was a stripling is scarcely read at all any more. He was John Dos Passos. Writers of my generation used to say that the great American novel had in fact been written, which was U.S.A. Mailer’s The Naked and The Dead reads and even looks like additional chapters of U.S.A. The other book which wowed me when I was really young has held up better than U.S.A., probably because it is not so burdened with historical particulars, is a minimalist work. It is Voltaire’s Candide. I have not read your Sad Movies, and Dos Passos surely never read anything by me. About twenty new books a week arrive at this house, most of them no doubt marvelous. I simply can’t keep up. The fact that you have completed a work of fiction of which you are proud, which you made as good as you could, makes you as close a blood relative as my brother Bernard. The best thing about our family, our profession, is that its members are not envious or competitive. I was with the great Nadine Gordimer recently, and a reporter encouraged us to speak badly of a writer who made one hell of a lot more money than we did, Stephen King. Gordimer and I defended him. We thought he was awfully damn good at what he did. Long ago, I knocked the schlock novelist Jacqueline Suzanne off the top of the Best Seller List where she had been for a year or more. She was a sweet, tough, utterly sincere lady, and, as I say, a blood relative. She sent me a note saying, “As long as it had to be somebody, I’m glad it was you.” For what it is worth: It now seems morally important to me to do without minor characters in a story. Any character who appears, however briefly, deserves to have his or her life story fully respected and told. I know you would have had way more clever things to say about your own death than I, so out of respect I won’t even try. But I did have the pleasure of meeting you once, back when I was about 15. I had just read Slaughterhouse Five and you asked me for my thoughts on it. My thoughts. A 15 year old. I don’t remember what I said–or, what really kills me, what you said–but the profound impression remained that you could be someone with so many brilliant things to say and still know you have things to learn. Even from a kid. I’d like to think you lived like a big old exclamation point. You don’t get that just from farting around.